Mighty Deals have been a great supporter of SitePoint, as well as a great reservoir of cost-effective front-end resources for developers — including everything from fonts to textures to patterns to brushes and more. Today we’re going to combine the two — and you’ll get to cash in on it! Firstly, we set the following brief for two of our favorite SitePoint design authors – Gabrielle Gosha and Annarita Tranfici. 1). Re-design the original Star Wars Poster, BUT set the story in an entirely new universe/genre. This could be anything: cowboys, gangster, steampunks, rom-coms, buddy-cop films or Bollywood. The possibilities are almost endless. 2). Choose any two Mighty Deals deals to help your design. 3). Present your poster to the SitePoint community. 4). Tell us what you did, which deals you selected and why. Simply tell us in the comments which poster you like best and why. – 1 person wins any five (5) Deals from the Mighty Deals Collection. – 4 people win any two (2) Deals from the Mighty Deals Collection. Entries close Thursday 19th June. Winners will be announced Monday 23rd June. Going into this design project I knew that I wanted to draw all elements, except for any textures. Initially, I thought I’d reboot Star Wars in a superhero type setting. Think Marvel and DC comics in a contemporary setting, but with the Star Wars characters with their own costumes and unique look. 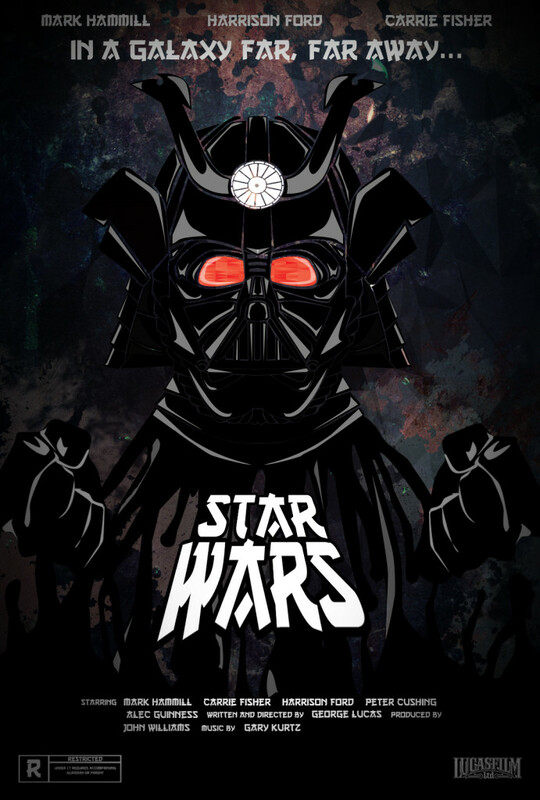 I eventually abandoned that idea and went in a completely different route, by setting Star Wars in the Japanese Horror genre – with Darth Vader as the focal piece. When I was around five or six, I remember the first time I watched Star Wars thinking that Darth Vader was cool. I didn’t care about any of the other characters to be honest. There was just something really great about this imposing figure cloaked from head to toe in all black with this incredibly cool helmet. Really, for me, Star Wars is synonymous with Darth Vader, so naturally I wanted to make sure he was front and center on my poster. Other than having to deal with possible overcrowding and having other things get lost among my textures I decided to keep to using one character for the design. The Japanese Horror theme was partly due to my being raised in Japan. I sometimes add Japanese elements to my work, this was one of those times. Vader’s helmet design really lends itself to being reconfigured to resemble the kabuto. Not to mention there is something about the character that with a little modification could easily fit into a horror film. Below you can see how I went from the standard Darth Vader mask to a kabuto inspired one used for the final design. 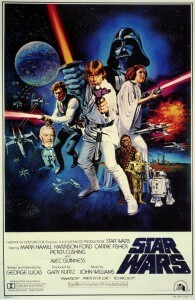 After looking for a couple of minutes, I finally settled on using two deals from Mighty Deal to do my Star Wars poster. I chose two different texture deals, the first one being 100+ Background and Business Card Templates and 75 Colorful Grunge Texture Megapack. As I mentioned earlier, I had initially wanted to do ‘Star Wars-meets-superheroes’: Batman, to be specific, so of course I wanted to use dark colors with some grunge and heavy textured resources. The 100+ deal had a lot of cool geometric textures going on which I really liked, and I always like to add grunge and paper textures to my work so the 75 Megapack was a must. When I realized I was going to change my concept, I figured that both textures would work perfectly in creating a sort of moody atmosphere. I hadn’t thought to put a texture in the eyes until my sister suggested I try the red texture, which worked out for a nice menacing look. With the textures: if you overlayed them and did some manipulation you would get something that looked a little like outer space. 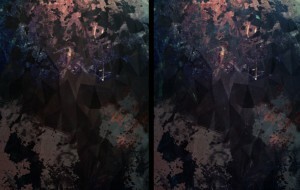 I ended up using two grunge textures and two geometric backgrounds. When I was offered the opportunity to participate in this contest, I did not hesitate; I did it since I love to work on posters, but mainly because the topic was really interesting. Star Wars is one of the finest cinematographic masterpieces in history and the possibility to offer my personal reinterpretation of its poster immediately took the form of a challenge I could not refuse to accept. 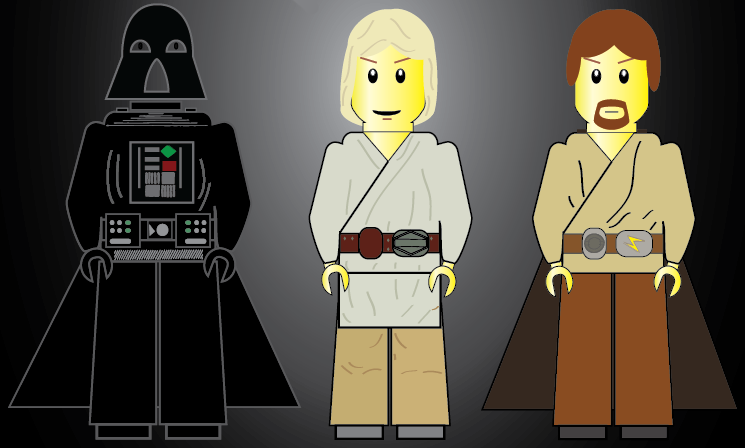 The idea to recreate some of the protagonists of the Star Wars’ saga in the form of Lego minifigures was not the first one that came to mind. Being a lover of all the English literature, in my original reinterpretation of the poster I would have really liked to include some references to the time when famous writers (such as Shakespeare or Jane Austen) lived and worked. However, when I started to think about the style in which I wanted to set up my work, I was captured by the idea of warriors designed in the version of the well-known colourful interlocking plastic bricks. When I was a child, I used to spend many hours playing with Lego bricks with my friends, and I remember with pleasure how we enjoyed this activity. I had a look at all the characters and made my selection, with the aim of putting myself in position for a very good result. 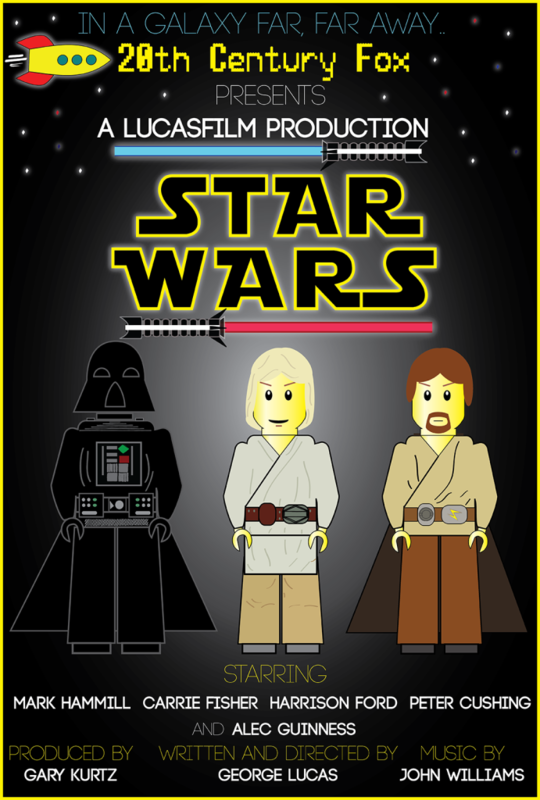 I chose to draw the minifigures of Darth Vader, Luke Skywalker and Obi Wan Kenobi and place them in the center of the poster, with all the other information around them. For my very first idea I wanted to place my characters in a totally ‘retro’ background, and use several series of shapes, colors, fonts and textures which would have helped me to achieve that. I made my final decision when I had already chosen and downloaded the two deals I had indicated when the request was sent. I’ve tried to use as many vectors as possible, doing my best to include them correctly in my work and add some details to my sketches. 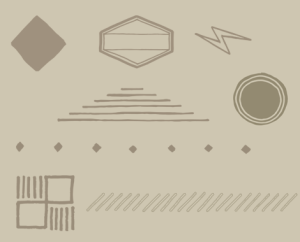 The deals I selected are: 20 Fantastic Ready to Print Retro Templates and 890 Unique Handwritten Decorative Shapes. As said before, I had planned to place my characters in a totally retro background, and these two deals seemed to perfectly fit my needs. I’ve used some of the decorative shapes to enhance the clothing of my three main characters and the background where they have been placed. I really hope you’ll appreciate my work. Thanks for the opportunity. So, there you have it — two wonderful pieces. All you need to do is help us choose a winner in the comments below. We will announce the Mighty Deals prize winners next Thursday (19th June). Of course, if you feel inspired, we’d LOVE to see you post your own idea. It’s certainly an interesting design challenge. Thanks for joining in. We will be announcing the winners Monday 23rd June.